We designed the Empathy Map at XPLANE many years ago, as part of a human-centered design toolkit we call Gamestorming. This particular tool helps teams develop deep, shared understanding and empathy for other people. People use it to help them improve customer experience, to navigate organizational politics, to design better work environments, and a host of other things. I have seen a lot of versions of the Empathy Map since we created it so many years ago, and they vary widely. The Empathy Map was created with a pretty specific set of ideas and is designed as a framework to complement an exercise in developing empathy. While the success of the Empathy Map is exciting and makes us very happy, a lot of the thinking has gotten lost in translation over the years, and the various versions that have proliferated across the web have somewhat degraded the original concept. More recently, I worked with Alex Osterwalder, designer of the Business Model Canvas, to develop a new tool for mapping organizational culture called the Culture Map, and in that process I learned a lot about canvas design. So I decided to create a new version of the Empathy Mapping Canvas, applying what I learned from Alex to make the tool more usable and to deliver better experiences and outcomes. More information, including a list of what’s new and some facilitation guidelines. Empathy map, originally uploaded by dgray_xplane. The empathy map, one of XPLANE’s methods for understanding audiences, including users, customers, and other players in any business ecosystem, has gotten some press lately because it was featured in Alex Osterwalder‘s excellent book, Business Model Generation as a tool for discovering insights about customers. GOAL: The goal of the game is to gain a deeper level of understanding of a stakeholder in your business ecosystem, which may be a client, prospect, partner, etc., within a given context, such as a buying decision or an experience using a product or service. The exercise can be as simple or complex as you want to make it. You should be able to make a rough empathy map in about 20 minutes, provided you have a decent understanding of the person and context you want to map. Even if you don’t understand the stakeholder very well, the empathy-mapping exercise can help you identify gaps in your understanding and help you gain a deeper understanding of the things you don’t yet know. 1. Start by drawing a circle to represent the person and give the circle a name and some identifying information such as a job title. It helps if you can think of a real person who roughly fits the profile, so you can keep them in mind as you proceed. In keeping with the idea of a “profile” think of the circle as the profile of a person’s head and fill in some details. You might want to add eyes, mouth, nose, ears, and maybe glasses if appropriate or a hairstyle to differentiate the person from other profiles you might want to create. These simple details are not a frivolous addition — they will help you project yourself into the experience of that person, which is the point of the exercise. 3. Divide the circle into sections that represent aspects of that person’s sensory experience. What are they thinking, feeling, saying, doing, hearing? Label the appropriate sections on the image. 4. Now it’s time for you to practice the “empathy” portion of the exercise. As best you can, try to project yourself into that person’s experience and understand the context you want to explore. Then start to fill in the diagram with real, tangible, sensory experiences. If you are filling in the “hearing” section, for example, try to think of what the person might hear, and how they would hear it. In the “saying” section, try to write their thoughts as they would express them. Don’t put your words into their mouth — the point is to truly understand and empathize with their situation so you can design a better product, service or whatever. 5. Check yourself: Ask others to review your map, make suggestions, and add details or context. The more the person can identify with the actual stakeholder the better. Over time you will hone your ability to understand and empathize with others in your business ecosystem, which will help you improve your relationships and your results. 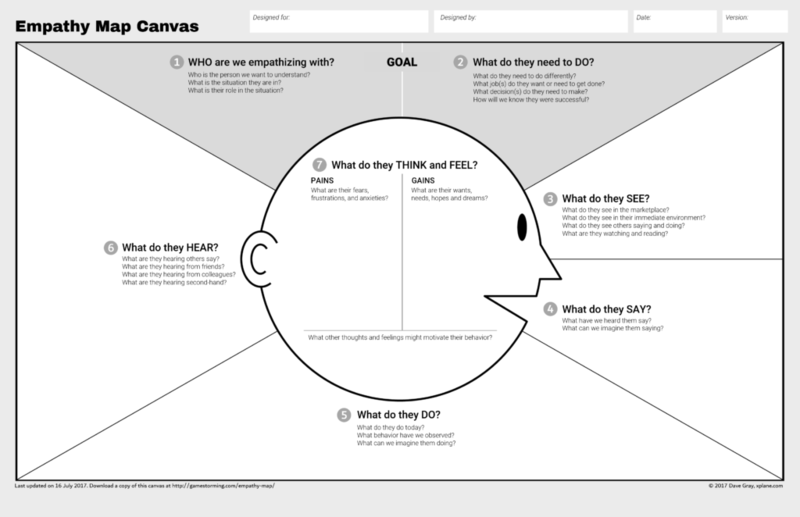 Download the Empathy Map Canvas. 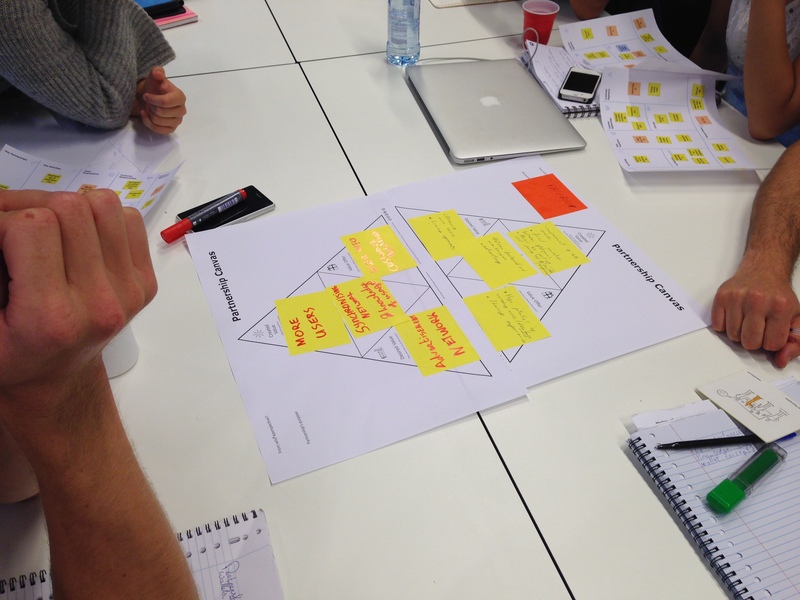 Click here for photos of empathy-mapping in action. The Long Table is a dinner party structured by etiquette, where conversation is the only course. The project ingeniously combines theatricality and models for public engagement. It is at once a stylised appropriation and an open-ended, non-hierarchical format for participation. Both of these elements – theatrical craft and political commitment – are mutually supporting in this widely and internationally toured work. The (often-feminised) domestic realm here becomes a stage for public thought. Here’s a great article by Pete Sena of Digital Surgeons on the power of Gamestorming, called Breaking Up with Brainstorming: How Gamestorming Helps Build an Innovation Culture. 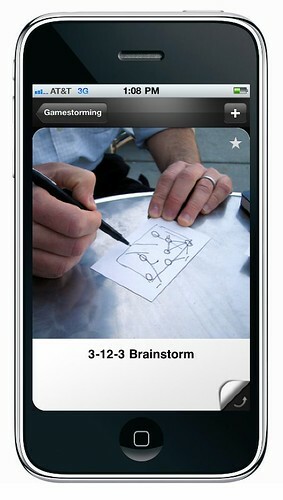 It references research on some problems with brainstorming and why Gamestorming enhances the creative power of groups. Squiggle birds is a quick exercise that you can use to get people stretching their visual thinking muscles. It takes about five minutes and quickly, clearly demonstrates how little effort is really required to make meaningful, easy-to-read images. The main point of the demonstration is that our minds are already pattern-making machines, and very little drawing is actually required to convey an idea. The mind will fill in the rest. I learned this exercise from my friend Chris Glynn, a fine teacher who teaches fine things. You can use the Draw Toast exercise to introduce people to the concepts of visual thinking, working memory, mental models and/or systems thinking. This also works as a nice warm-up exercise to get people engaged with each other and thinking visually. Plus, it’s fun! Any number of people can play this game. After a couple of minutes, ask people to share their diagrams with each other and discuss the similarities and differences. Ask people to share any observations or insights they have about the various drawings. You are likely to hear comments about the relative simplicity or complexity of the drawings, whether they have people in them, how technical they are, how similar or different they are, and so on. Although the drawings are different in content, they tend to be similar in structure. That is, most drawings of mental models tend to contain three to seven elements, connected by lines or arrows. The main point of this exercise is to demonstrate the power of visual thinking to represent information. 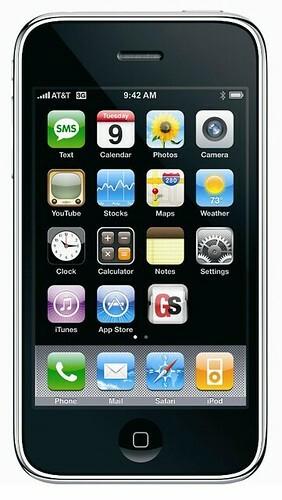 Visualizations of this kind tend to be easily understandable, although they are visually as rich and diverse as people. Pictures can be fundamentally correct even though they are quite different. There is no “one right type” of visualization. When people visualize a mental model, they usually will include 5-7 elements, linked together by lines or arrows. The number of elements tends to correspond to the number of things people can hold in their working memory, also known as short-term memory (See The Magical Number Seven, Plus or Minus Two for more information). This is also a nice warm-up exercise that is fun and gets people talking to each other. There is an excellent TED talk by Tom Wujec which you may want to watch in preparation. It may also be useful to show to the group in sessions as a way to share insights after the exercise. Tom also has a page with ideas for extending this exercise into group problem-solving which you can find at DrawToast.com. Object of play: The partnership canvas is a tool that enables visualization of current and/or future partnerships. It can also be used for early testing of the value creating potential of a partnership between two partnership candidates. The tool’s purpose is to define your business priority for partnering, and empathize with your partner to explore whether there is potentially a match. The partnership canvas can be used as a stand-alone tool, but comes to full strategizing value when it is jointly used with the business model canvas, also available on this site. Number of players: This can be done by yourself, but preferably with 2 teams of max 5 people representing each side of the partnership. Alternatively, make multiple pairs if there are more people. b) List what would be ideal partners to work with and why. Organize a post up. Select a top partnership candidate, or multiple candidates. c) Create (multiples of) 2 teams; 1 representing your business, 1 for a potential partner’s business. b) Compare the two partnership canvasses by mirroring the partnership perspectives. 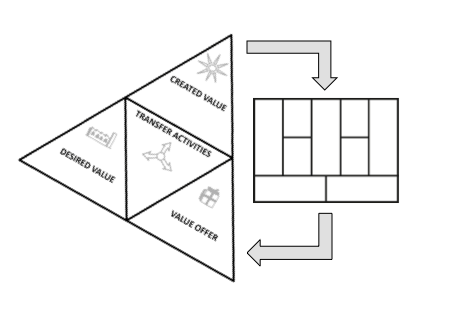 Compare between value offers of one team, to desired value of the other team, and whether there is mutual understanding of the transfer activities. Check for a clear fit. c) Create agreement on the created value for each partner. Adapt partnership canvas and iterate step 3 if required. 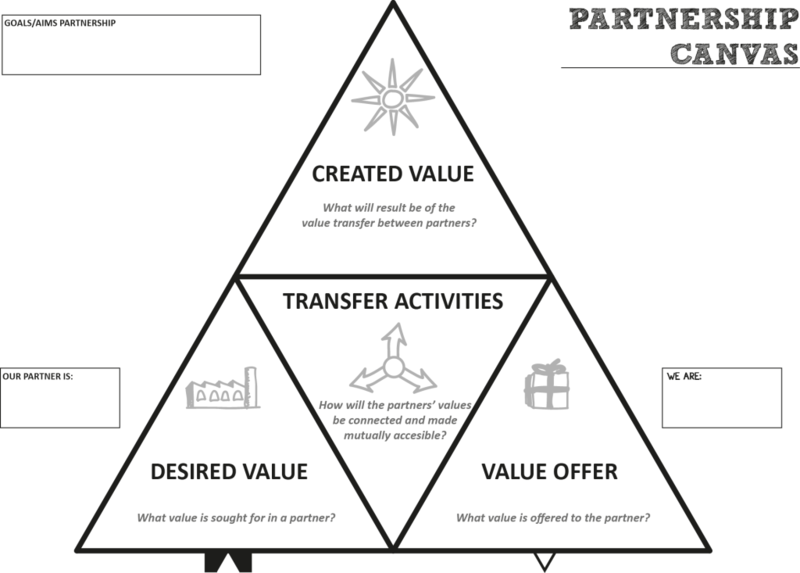 a) Do the elements of created value provide clear added value to each partner’s business? Strategy: The partnership canvas can be used to explore the idea of engaging in a partnership. A team can use the canvas to prepare for an upcoming conversation with a potential partner. Alternatively the session can be conducted jointly with a potential partner if there is already a mutual interest to explore partnering possibilities. The tool can firstly be used to determine whether there is a technical fit between two businesses. By working in teams and negotiating certain rivalry is always invoked, and teams can also get a sense of cultural fit between two partnering businesses. Fast Company discovers dot voting! Looks like Fast Company magazine discovered dot voting. So it’s officially a thing now. Woohoo! 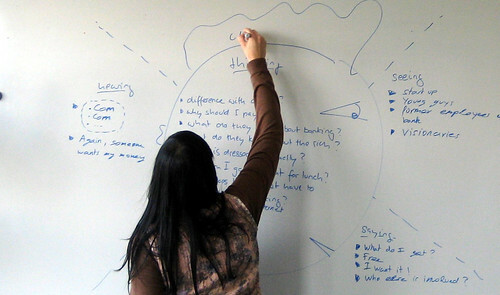 The dead simple way Google Ventures unlocks great ideas. The Gamestorming Card Deck is drawn from the GoGamestorm.com blog, the companion website to ‘Gamestorming: A Playbook for Innovators, Rulebreakers, and Changemakers’ by Dave Gray, Sunni Brown, and Dave Macanufo. The cards are frequently updated and will help you learn the fundamentals of visual language, how to illuminate complexities by mapping the big picture and how to use improvisation and games to innovate and solve real problems and help you feel more confident about using visualization in meetings. The cards in this deck show you not only how to play — with images and instructions on both sides of the cards — but how to organize the games into favorites and ‘agendas’ for your meeting in the form of stacks. 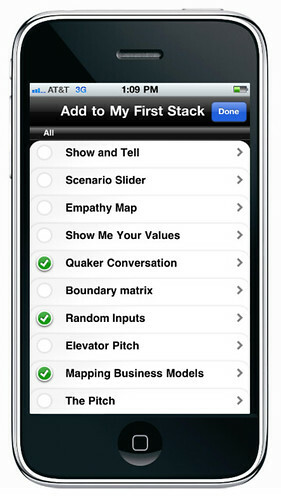 The stacks can be played by swiping through each of the cards as you proceed through your meeting or brainstorming session. After you’ve downloaded the app, click on the app icon to open the app. 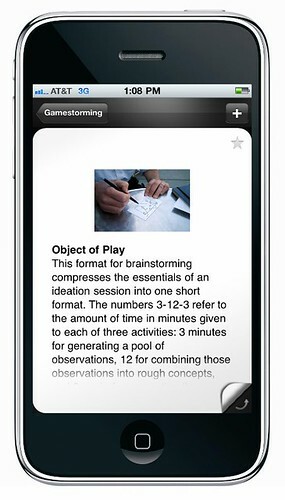 You’ll see a deck of cards that you can scroll through, just like you can scroll through apps. Each card represents a game from the Games Wiki. (The app syncs with the wiki, so whenever we add new games to the wiki you can add them to your app by going to the settings menu and clicking “refresh.”). Tap a card to open that card. You’ll see the large version of the card. If you tap the little dog-ear to the lower right the card will flip over and you can read the instructions for that game on the back of the card. The instructions are exactly what you would see in the book or on the Games Wiki. You can scroll down to read the whole card. 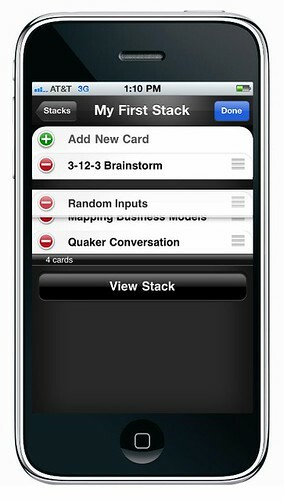 There’s also a stacks menu, where you can create a stack by adding cards. Once you have a stack, you can click “edit” to rearrange the games in the stack. Create as many stacks as you want. For example you might create one stack for a brainstorming meeting, one for a company retreat, and another for your weekly status meeting. When it’s time for the meeting just open the stack and you can quickly flip through the games in that stack. 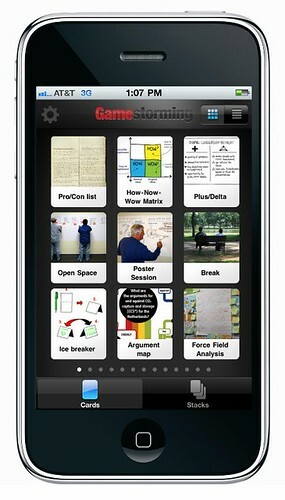 Check out this Gamestorming cheat sheet by master Gamestormer Brynn Evans.